1.In the UK and Germany the cars ('First Prize’) will be delivered with UK or German VAT paid respectively. In all other countries the First Prize will be delivered with a maximum of 20% VAT paid but any further costs (VAT/taxes/import duties/registration costs due in the destination/country of final registration) will be the responsibility of the First Prize winner. 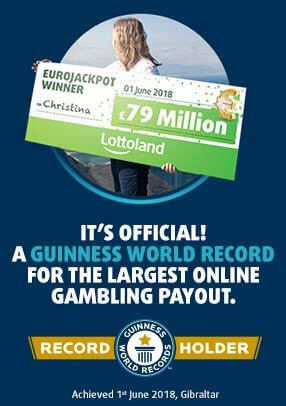 2.The First Prize winner will be required to send a copy of their passport to Lottoland to confirm their identity, age and also to prove that if the purchase was made by credit card that the card was legally theirs or that they had authorisation to use it, before any prize will be paid or delivered. Any failure to meet these obligations may result in the First Prize winner being disqualified. 3.Following receipt and verification of the details requested above by Lottoland, the First Prize winner will be contacted in order to make arrangements for delivery of the prize. Lottoland cannot guarantee delivery within a certain timeframe. If possible Lottoland will take into account First Prize winner’s requests in terms of colour schemes of the cars, but we cannot guarantee all requests can be facilitated. If due to circumstances beyond Lottoland’s control, we are unable to provide the stated First Prize, we reserve the right to award a selection of substitute Left and Right Hand Drive cars of equal or greater value. 4.Cash Alternative: As an alternative to physically deliver the First Prize, Lottoland can at its sole discretion settle in cash („Cash Alternative“). 5.All First Prize winners will be required to provide photographs and/or pose for photographs and videos, which may be used in future marketing and public relations by the Promoter in connection with the Competition and in identifying them as a winner of a Competition. 6.Lottolands’ General Terms & Conditions apply.